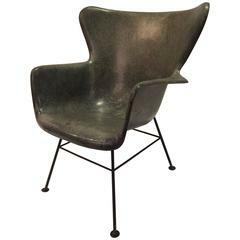 A great 1960s bent pole lounge chair that rocks and swivels. An nice aged patina to the wood. Pictured pillows and cushions come with the chair. 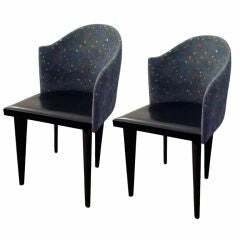 Finland: Pair of Voitto Haapalainen "Prisma" lounge chairs in black leather and zinc plated steel, circa 1970, manufacturered by Tehokaluste Oy. 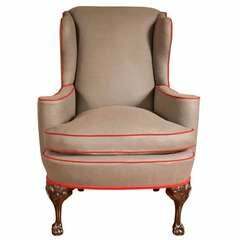 A wing chair in teak for indoor our outdoor use with drip thru cushions. Handcrafted exclusively by Almond & Company. Shown in COM and oiled finish. 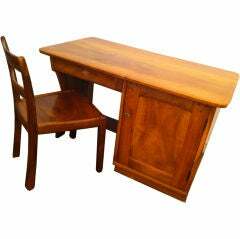 Designer: Unknown Manufacture: Unknown Period/style: Mid-Century Modern Country: US Date: 1940s.